Welcome to India's Tandoori Brentwood Secured Online Order System. We respect our customer privacy and comply with industry standards. Served With A Choice Of Either Veggie Samosas Or Pakoras, Chicken Tandoori, A Choice Of A Vegetable Entree, A Choice Of Either A Chicken Or Lamb Entree, Both Rice And Naan And Dessert. 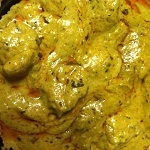 Chicken Cooked In A Tomato Based Creamy Sauce. Leavened Flour Bread Garnished With Garlic. Curd Cheese Mixed Into Savory Spinach. Potato Chunks Mixed Into Savory Spinach. 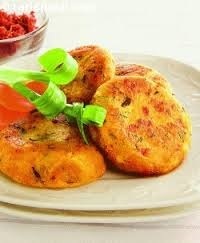 Crisp Patties Stuffed With Veggies Or Lamb. Veggies Or Potatoes Dipped In Garbanzo Batter. Chicken Or Cheese Dipped In Garbanzo Batter. Shrimp Or Fish Dipped In Garbanzo Batter. Onion Dipped In Garbanzo Batter. Traditional Favorite Made In The Tandoor. Mushrooms Sauteed With Bell Peppers And Onions. Deep Fried Chicken, Served With Aioli. Tender Chicken In A Lentil Based Soup. 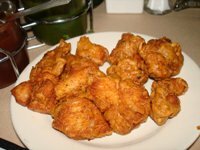 Chicken Strips With A Leafy Base. Tomato Salad With Hints Of Feta Cheese. Chopped Tomatoes, Cucumbers And Onions. Served with a choice of either veggie samosas or veggie pakoras, chicken tandoori, a choice of one chicken, one lamb and one fish entree and two choice of vegetables, two rice, two breads, and choice of dessert. Served With A Choice Of Either Veggie Samosas Or Pakoras, A Choice Of Three Vegetable Entrees, Both Rice And Naan And Dessert. Boneless Chicken Marinated In Yogurt And Pickles. Lamb Chops Grilled In The Tandoor. Grilled Fish Marinated In Garlic And Spices. Get A Bit Of Chicken, Lamb, Prawn And Fish. Cooked With Plenty Of Onions. Zesty Curry With Potatoes And Lemon Juice. Mildly Spiced Chicken Cooked In Curry Sauce. Onion Chicken Curry In Coconut Milk. Chicken Mixed Into Savory Spinach. Sauteed With Bell Peppers, Onions And Tomatoes. Lamb Cooked In A Tomato Based Creamy Sauce. Lamb And Veggies Stir Fried In A Thick Sauce. Onion Lamb Curry In Coconut Milk. Lamb Mixed Into Savory Spinach. Sauteed With Bell Peppers, Onoins And Tomatoes. Shrimp Cooked In Onion Curry Sauce. Onion Shrimp Curry In Coconut Milk. Prawns Cooked In A Tomato Based Creamy Sauce. Fish Cooked In Onion Curry Sauce. Onion Fish Curry In Coconut Milk. Fish Cooked In A Tomato Based Creamy Sauce. Fish Cooked In A Thick Curry Sauce. Mixed Veggies Cooked In Curry Sauce. Mixed Veggie Curry In Coconut Milk. Veggies Cooked In Tomato Based Creamy Sauce. Tofu Cubes Mixed Into Savory Spinach. Baked And Mashed Eggplant With Spices. Potatoes And Cauliflower In Dry Curry Sauce. Okra Cooked In Herbs And Spices. Mushrooms Stir Fried In Onions And Spices. Veggies And Cheese Balls In A Creamy Saffron Sauce. Creamy Mixture Of Different Lentils. Chili Peppers Cooked In A Creamy Sauce. Curd Cheese In A Tomato Based Creamy Sauce. Peas And Curd Cheese In Curry Sauce. Basmati Rice With Mushrooms And Spices. Served With A Samosa, Chicken Tikka Masala, A Choice Of A Vegetable Entree, Both Rice And Naan, And Dessert. Served With A Samosa, A Choice Of Two Vegetable Entrees, Both Rice And Naan, And Dessert. 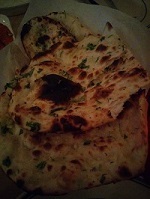 Garlic Naan Garnished With Basil. Parathas Stuffed With Ground Lamb. 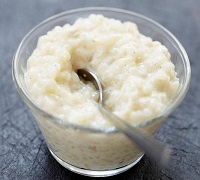 Sweet Basmati Rice Cooked With Milk And Nuts. Mango Or Pistachio. Indian Ice Cream.